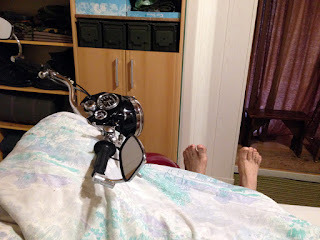 Simon and his Royal Enfield spend "An Evening In." "Hi David, you only dream about them (Royal Enfields, that is!)?" 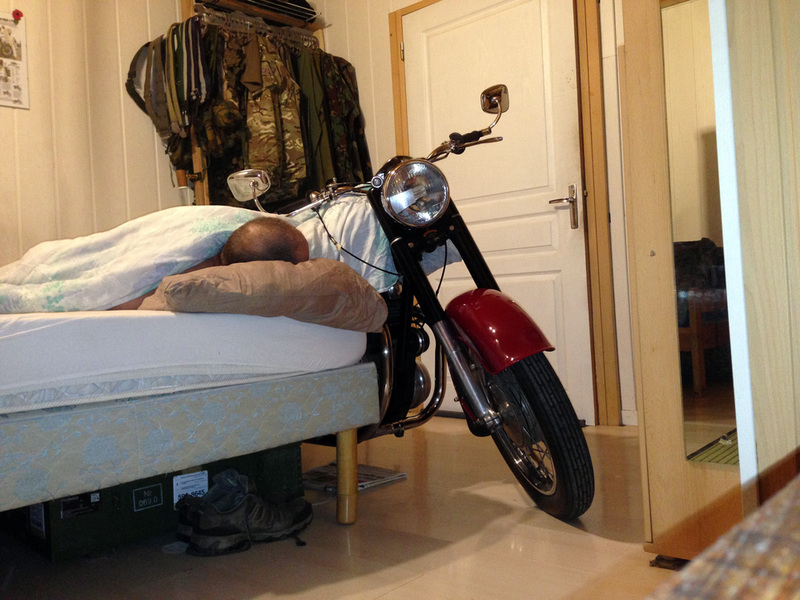 His devotion to his Royal Enfields goes far beyond mine. 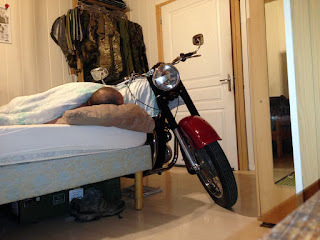 While my Bullet sleeps in its garage, Simon attached photos that show his Royal Enfield Meteor Minor much more at home — inside his home. Simon, known as "Scaleyback" on a variety of Royal Enfield Internet forums, put a lot of work into the photos. 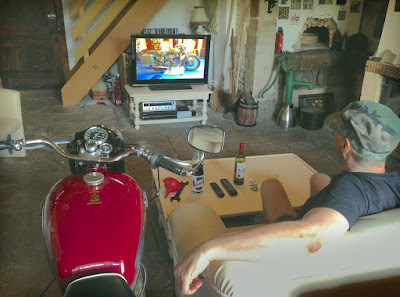 I particularly liked the scene of man and motorcycle watching television, with their choice of beverages at hand. "I've got wine, bottle opener and a glass, Kevin the Meteor Minor has oil, a spanner and funnel! "P.S. 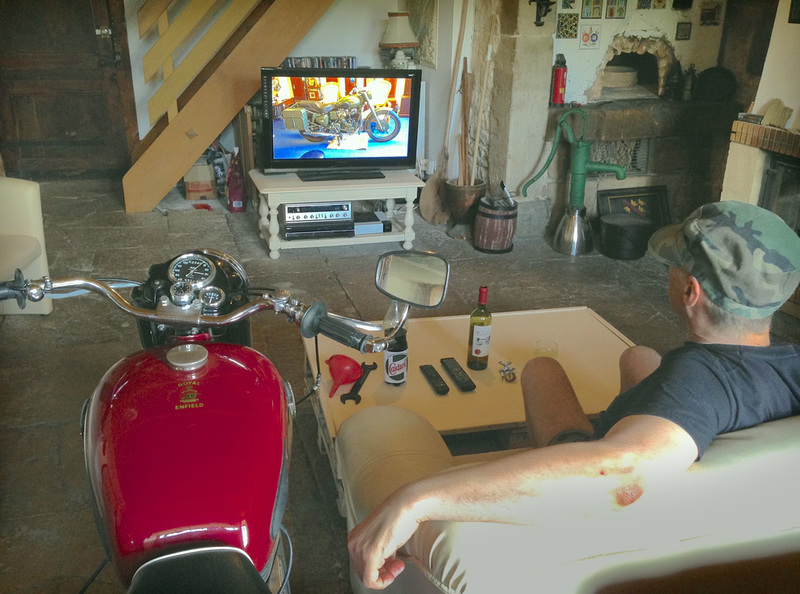 My Bullet 'Tornado' is on the TV screen!" Nothing like "A Warm Engine on a Cold Night." Although one is left with "That Morning After Feeling." "Tornado" doubles as the household timepiece. Marvelous as these photos are, you've just got to see Simon's video demonstration of the trafficators fitted to his Meteor Minor. Watch it all, and with the sound up! As I've said before Simon ....."Bonkers!"... (But in a nice sort of way). Barry. Great fun! Thanks for that David!